I heard a lot of great stuff about Neogen’s skincare products, and finally managed to buy it in Korea’s Olive Young last year. If you have seen a lot of beauty blogs, you would have seen this brand name floating around quite often. Many people seem to love Neogen because the products are so effective – kind of like COSRX, and I absolutely love COSRX, so I decided that this I definitely have to try this out for myself as well. This unique foam cleanser is a must try for oily, combination, or acne-prone skin. The star ingredient in this cleanser is fermented green tea extract, which brightens, calms, and hydrates skin. The gentle foam effectively removes impurities such as sweat and dirt from the skin without stripping your skin’s natural oils. Lightweight and hydrating, this is the perfect water-based cleanser to use in your double-cleansing routine. The pH of this product is 8. See the full list here, together with information on safety and irritants. Packaging: I’m so used to the unconventional tube packaging (like this kind you get from Althea) that I was a bit surprised by this. Firstly, it’s pretty bulky, and I had to admit that I didn’t have the easiest time bringing this back from Korea because it’s not the most travel-friendly thing you can get. What makes this quite unique, however, is that the product is pumped out, which I absolutely LOVE because I find that it’s a lot easier + less messy. 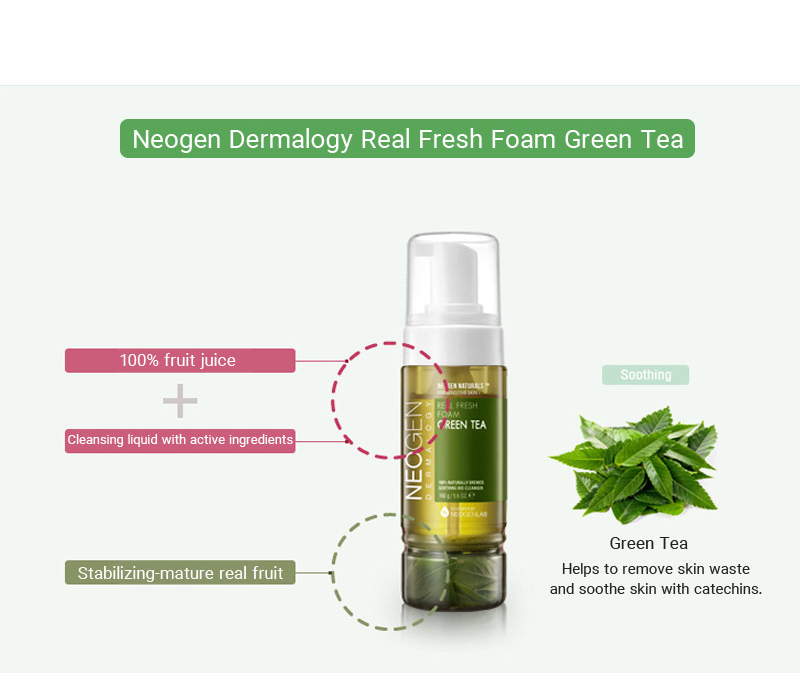 What’s also interesting is that you can actually see the green tea leaves fermenting at the bottom of the cleanser itself – so you know that you are really getting the real deal here! Texture: It looks like just liquid inside, which is already quite different from most other gel cleansers you get on the market. However, when you pump it out, it comes out as foam bubbles instead. I definitely enjoy cleansing with as much foam as possible – I don’t know about you, but I tend to feel a bit strange if there’s no foam in my cleanser. Effectiveness: This green tea cleanser is said to thoroughly cleanse your face without irritating it, hence making it suitable for all skin types. I can’t say for sure if it really does a very good job out of cleansing – how do you know for sure, right? I can see, however, that my makeup residue is usually washed off quite well, and my skin doesn’t look too dried out from the cleansing. I do also notice that my acne problem is better managed after I started using this cleanser, so there’s definitely less dirt clogging my pores! Some beauty reviewers have warned that this cleanser can potentially dry your skin out. While I personally don’t feel that it has happened to me, I have no problems using this in the morning when my skin tends to be more dry, so I think it may not pose too big an issue, unless you really have super dry skin (like, say, in winter). I can see why so many people love this cleanser. It certainly looks like it does a good job of washing your face, but more importantly, I actually enjoy the process of cleansing when I am using this. It feels very relaxing and, dare I say, luxurious, to have this substantial green tea foam cleaning your face. Another thing that really sets it apart from most other cleansers is the ingredient that ferments at the bottom of the bottle. As the years passed, I’ve grown more wary of what I am putting and using on my face, so I am pretty comforted when I can see exactly what goes into my skincare products. I haven’t gotten around to trying the other ingredient variations of this cleanser (cranberry, cereal etc. ), but I’ll certainly let you guys know how they fare compared to this green tea variant! Never heard of them, I’ll have to give them a look through! Looks like I’m heading to OliveYoung today to hunt this down! As always, thanks for reviewing it for us. One of the rare cleaners which I’ve repurchased. I haven’t tried any of the other varieties cos I love this one so much!